No children were hurt this morning when a West Jackson Elementary School bus began smoking. That was according to a Jackson County School spokesperson. The fire department arrived and said it was most likely an electrical issue. Karen Bridgeman the Communications Director for Jackson County Schools says the bus began smoking as the buses lined up outside the school. Kids were waiting to get off when the driver noticed the bus smoking. All the kids exited the bus, so no one was harmed says Bridgeman. The bus is “still drivable” according to West Jackson Fire Department Chief Ben Stephens. 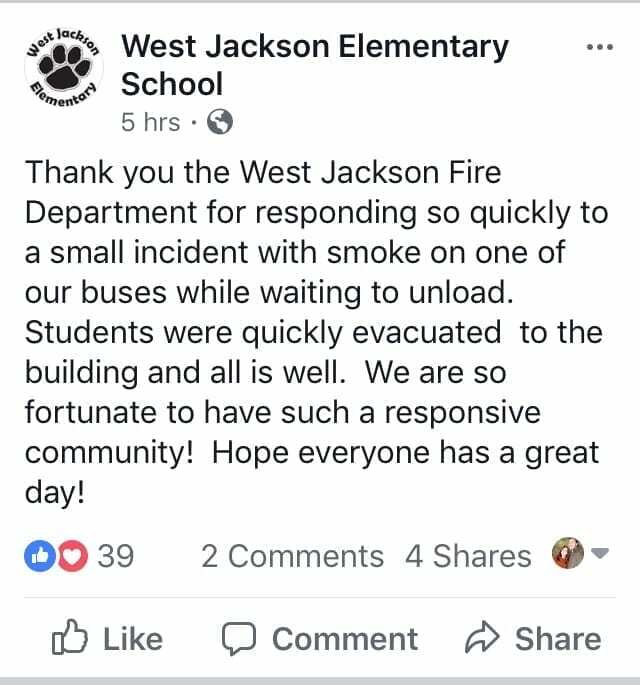 West Jackson Elementary School posted about the incident on their Facebook page thanking the fire department. Bridgeman also said the parents of each child on the bus were contacted about the situation.